The Robinhood app is a fantastic way for just about anyone to be able to make money fast in the market with little to no fees involved. But does that mean you should go out and download the Robinhood app today? In the following review of Robinhood, we will talk about the app, what it is, how it makes money, and the pros and cons of using Robinhood vs the Competition. In the age of do-it-yourself (DIY) apps, it was only a matter of time before the internet disrupted the stock brokerage business. Given the substantial profits made by brokerage firms over the years (a famous industry joke recounts the story of a customer, whose broker had taken him to the local yacht club, asking “where are all the customers’ yachts?”), the industry was certainly ripe for the picking. The initial wave of disruption was performed by discount brokerages which enabled clients to place orders for stocks, bonds, mutual funds, and ETFs (exchange-traded funds) online with reduced commissions. These firms snagged significant market share from full service brokerages by appealing to investors who don’t see a need to pay a stockbroker for advice when they are making their own investment decisions. The Robinhood app takes the concept of the discount brokerage to its logical extreme – by eliminating commissions altogether, making it one of the best money making apps around. The app enables you to place trades for a wide variety of stocks and ETFs (but not mutual funds, options, or commodities) for free using real-time market data but without many of the research and portfolio management services offered by brokerages that charge commissions. It should be noted that you must pay for FINRA and SEC fees on sell orders, but these typically amount to no more than $.50 per trade. Launched on the App Store in 2014, the Robinhood app is now available both for iPhones and Android devices. The company’s website is at Robinhood.com, however, the app can only be used on a mobile device, no desktop trading functionality is available. The company’s mission is to “democratize the financial market,” which it hopes to accomplish through the ability of its app to provide investors with an unlimited number of free trades without any minimum balance requirements. By August 2015 the company noted that it had processed over 2 million free trades. Currently, the app boasts over two million users, and recently raised funds at a reported valuation of $1.3 billion. Conceived by Vlad Tenev and Baiju Bhatt, who both attended Stanford together, Robinhood is, like discount brokers such as Ameritrade and Charles Schwab, registered with the SEC as a broker-dealer. To use the app, you must either be a U.S. citizen or have a valid U.S visa. A valid social security number is also required, and you must be at least 18 years old. Only individual accounts are supported at this time. The application process occurs online, with no paper forms needed. The process is streamlined, and can be completed in five minutes or less, especially if you are familiar with using mobile apps. The basic account functions as a limited margin account allowing for instant settlement as well as instant deposits, with no shorting or leverage. Leverage can be used by upgrading to a Robinhood Gold margin account, as long you meet the minimum balance requirement. You can also downgrade to a cash account if you like. Only personal accounts for a single individual can be opened, corporate and joint accounts are not supported at this time. A basic trading account has no minimum balance requirement, while Robinhood Gold accounts require a $2,000 minimum balance and offer extended trading hours and margin equal to twice your cash value. The app provides continuous tracking of your available Gold account buying power. Gold account fees are set at a flat rate determined by account size tiers based on 0.005% of account value, for most amounts, plus any regulatory fees. Thus, for an account with $2,000, a flat fee of $10 per month would cover all trades. If the account had $6,000, the monthly fee would be $30 per month. The free Robinhood Instant upgrade allows you to use as much as $1,000 of pending bank deposits right away. This enables you to reinvest funds without being required to wait for settlement (which takes three days) to be completed. In a basic limited margin account, you can invest funds derived from stock sales immediately. SEC and FINRA regulations applicable to margin accounts still apply. There is no charge to transfer an account into the app. Outgoing transfers are charged a $75 fee. The app itself, while well designed and easy to use, offers bare-bones functionality when it comes to research. Simple line graphs can be accessed, but not indicators or tools for charting. Streaming news feeds offer only headlines. Any investment research you want to perform should be done on other services. The app does offer convenient watch lists that can be created simply by typing the name or symbol of a company. It offers customer service via email or by phone. Any trades placed through a broker over the phone will accrue a $10 charge. Unlike direct access online brokerages, Robinhood does not offer direct order routing. Market orders are allowed, as are limit orders that can be categorized as good-for-day (GFD) or good-until-cancelled (GTC), depending on how long you want the order to remain in force. Stop orders are allowed as well. Robinhood, like other brokerage firms, is an SEC-registered broker-dealer, a member of FINRA, and belongs to the SIPC, which offers protection from loss due to theft or fraud (but not investment selection) in your account up to $500,000. The app uses Apex as its clearing firm, and encrypts data using SSL. Robinhood allows you to link your bank account to your stock account using your routing and account numbers, and also enables you to use the same username and password that you use at certain selected banks, including Wells Fargo, Citibank, Chase, and Bank of America, among others. As with other brokerage firms, ACH transfers are free and take around 3 business days to complete. The service has recently set up an automatic deposit feature that allows you to schedule ACH transfers either weekly, biweekly, monthly, or quarterly. Who Is the Robinhood App Designed For? Frequent mobile phone users: If you organize most aspects of your life on your phone, adding stock and ETF trading could serve as a natural extension to its functions. Frequent traders: If you trade stocks and ETFs regularly, even small commissions can add up significantly over the long run, so a discount broker like Robinhood can save you a lot of money over time. DIY investors: If you do your own research elsewhere before making an investment, a trading platform that also offers research and charting services is likely to be superfluous. Causal investors: If you don’t need extensive research options from your trading platform or the ability to consult with an advisor, the Robinhood app can be a convenient, no frills way to invest. What does it mean when a brokerage firm sells order flow? There is nothing illicit about the practice, it is done by a number of other brokerage firms and involves routing orders through third party firms that benefit from the practice. It can result in your orders receiving slightly worse execution prices than they would at firms which don’t use the practice – this may not matter to investors making only a small number of trades, or trading small amounts, but for investors placing larger orders or trading frequently it can add up to a significant amount over time. Thus, in some cases you might be better off paying commissions to a brokerage firm rather than getting “free” commissions that actually cost more when transaction execution prices are considered. No commissions: This is a core benefit of the app, allowing you to put as much of your money to work as possible. No account minimum: This feature benefits investors who are just starting out and don’t have large sums to invest right away. Easy to open an account: Especially for those familiar with using apps on their mobile phones, the account opening process is quick and easy. Robinhood claims users are notified of account approval within an hour, at which point they can set-up an account transfer to fund their account. Ease of use: Placing buys and sells is a breeze using the app, with its well-designed interface and intuitive functionality. Convenience: Trade wherever you are whenever you want (subject to market trading hours). All you need is a connected mobile device. No access to direct order flow: While selling its clients’ order flows provides Robinhood with money to help fund the service’s operations, this approach can result in suboptimal transaction pricing at times. While this may not matter much to investors making small trades, for larger orders and frequent traders it can increase the cost of using the app. Securities limitations: Robinhood only allows you to purchase stocks and ETFs. For investors who prefer to also trade securities such as options, futures, and mutual funds in the same account the app is not an option. Single account option: The app only offers individual accounts, which means that those wishing to establish retirement accounts, or joint accounts, will need to look elsewhere. Minimal research tools: The app is not designed for investors looking to perform extensive research on the same platform where they place trades. Additionally, the lack of Level 2 or time and sales information that day traders rely on to make decisions makes it unlikely such traders will benefit from using the app. No desktop application: You can only access your Robinhood account through a mobile device using the Apple iOS or Android operating systems. No trades can be placed through the company website. Robinhood is not the first app to offer no commissions trades. However, with Loyal3, a commission-free service that offered access to far fewer than the 5,000 plus securities Robinhood does, going out of business, it is the only major app of its kind currently operating. How does Robinhood compare to other apps designed for investors just starting out? While an app such as Acorns may serve a different function, some of the principles remain the same. Acorns allows you to invest spare change from online and credit card purchases in a robo advisor account. Robo advisors provide investment management for your investments based on algorithms that take into account your financial situation and investment objectives. While Acorns offers a different service, one aimed at long-term portfolio management rather than trading individual stocks and ETFs, it serves a similar purpose – offering investment services to beginning investors and those with small amounts to invest. The Stash app is another service that helps beginning investors learn more about the investing process. With a minimum investment of just $5, Stash helps you build a portfolio designed to match your preferences, such as a tech-oriented portfolio, or one that emphasizes socially conscious investments. These apps are by no means mutually exclusive. If you want to build up your investment portfolio without making all the investment decisions yourself, you can use Robinhood to pick your own stocks and Acorns to build up funds to be managed by a robo advisor. If you’d like some assistance in building a portfolio that reflects your beliefs you can add Stash into the mix. Hiring a stockbroker or financial advisor to perform these services could very likely be prohibitively expensive or unavailable if you have only a small amount to invest. Investors who prefer to do things themselves can also benefit from using these services, which don’t require the assistance of a human advisor. The Robinhood app is a useful service for investors with small amounts to invest who can’t meet minimum account balances at other brokerage firms and for those looking to save on the commissions they pay. If you are the latter type of investor, and you trade frequently or in large volumes, the app’s inability to offer direct order flow means you should consider whether a firm that offers direct order flow will actually be less expensive to use in the long run. Robinhood is also not the best solution for traders who rely on their trade platform for research and market data such as time and sales to help guide their trading. Limitations as to the types of accounts you can establish using Robinhood also restricts the number of investors who can make use of the app. 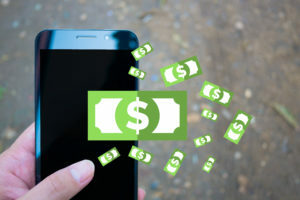 While the app is not necessarily the optimal option for all investors, it does serve as an attractive alternative for mobile phone savvy DIY investors who want to trade without commissions. The ease of opening a Robinhood account and of using the app once an account is opened makes it a convenient means of participating in the investment arena. Casual investors, whether millennial investors just beginning to invest or price sensitive investors of any generation, can benefit from the app as a no frills gateway to the financial markets. Next Post: Gazelle Review … Why wait to upgrade?